A couple of teenagers are terrorised by a murderous truck driver. The first third of Jeepers Creepers is quite superb, but things deteriorate rapidly after that, and, by the end, all the tension has dissipated and the film has fizzled into mediocrity. The Region 2 disc, from Warner Home Video and Helkon SK, distils the essence of the US disc (a dual sided affair dictated by the provision of both full-frame and widescreen versions – the UK disc is 1.78:1 anamorphic widescreen only), presenting a set of features as comprehensive as any fan could wish for: Victor Salva provides a well-prepared commentary track; there’s an outstanding behind the scenes documentary (lasting about an hour); and eleven deleted or extended scenes (totalling about 15 minutes, including one that was hidden as an Easter egg on the US disc). The Region 1 disc, from MGM/UA features a couple of minor bonus features missing from the UK disc: a couple of unrelated trailers and a very short interview with Richard Matheson, explaining the origins of Duel (another unbilled Easter egg) – nothing worth making a lot of fuss about. 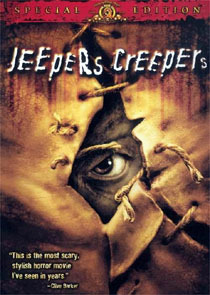 The UK disc boasts an extra Jeepers Creepers trailer and a couple of American TV adverts. Both discs have animated menus, but only the UK disc has animated chapter selection menus. Audio on both versions is Dolby Digital 5.1, at 448kbps. There seems to be something wrong with the mastering on the UK disc: close examination of the truck attack in chapter three (chapter five of the US disc), for example, reveals that every frame has a double-exposure effect, which isn't present on the US version. This has a very detrimental effect on playback, and for this alone potential buyers might want to choose the US disc.